This evergreen tree, also known as pimenta berry, yields a beautiful oil produced by the water or steam distillation of the crushed berries using the cohobation technique (distillate water is continuously recycled giving rise to higher degree of saturation of the water to maximize oil yield). Most of the oil production occurs in Jamaica with a few other locations producing oil using imported berries from various West Indian, Central and South American origins. Typical yield of oil is 3-5% by weight. Because of the high eugenol content (50-75%), allspice oil is one of a handful of essential oils with a density slightly greater than water. There have been reports of a methyl eugenol chemotype of this oil as well, but the typical berry oil will contain 10-25% methyl eugenol anyway. The oil has a sweet, spicy, clove-like odor, fruitier than the pimenta leaf oil which is less expensive. It has a fresh and clean top note and a long-lasting, sweet, balsamic-spicy body note with hints of tea-like undertones. 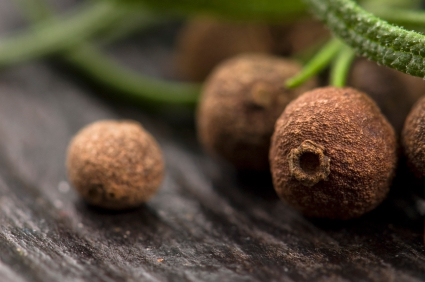 The name “allspice” originates from the likening of the odor to a mixture of nutmeg, clove and cinnamon. In perfumery, allspice oil is typically used as a modifier in men’s fragrances, particularly in spicy fougeres and in oriental types.